Launched in 2011, Cities United is a national movement focused on eliminating the violence in American cities related to African American men and boys. The 86 mayors participating in Cities United intend to reduce violence by 50%, by the year 2020, in each of their cities. Moreover, they are committed to restoring hope to their communities and building pathways to justice, employment, education, and increased opportunities for residents. As a resource, Cities United helps mayors assess their current situations, increasing opportunities for awareness, action, advocacy, and accountability in communities across the country. The organization provides assistance with planning and implementing solutions by sharing best practices, instituting innovative approaches, and understanding how and where to recon figure resources. 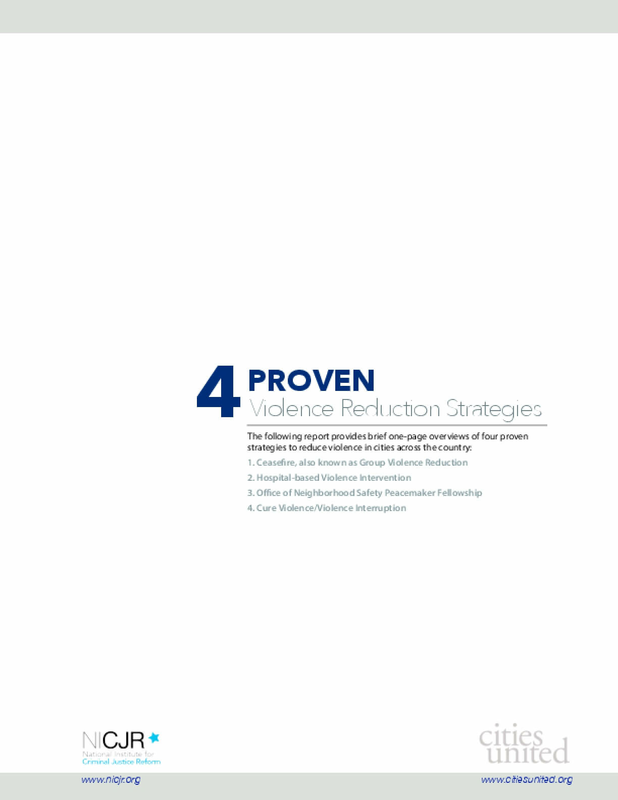 To that end, this publication highlights four effective violence reduction strategies employed by many Cities United member cities. These four strategies have proven effective at reducing Black male victimization. Identifying and focusing on individuals, groups, and neighborhoods at the highest risk of being involved in gun violence. Engaging those individuals in a trusting relationship with trained case managers/life coaches/outreach workers. Providing services, supports, and opportunities to the participants. Several Cities United partner cities are utilizing these strategies. Ceasefire is being successfully implemented in Oakland, CA; New Orleans, Louisville and Minneapolis are all instituting Hospital-based Violence Intervention programs; Cure Violence has been replicated in many CU partner cities, including Philadelphia; and the Richmond, CA Operation Peacemaker Fellowship model is being launched in several cities in beginning in 2017. The following brief is an overview of each of these four proven strategies with a list of resources at the conclusion for those cities seeking to gain more information. You can find other examples of what's working at www.citiesunited.org. Copyright 2017 by Cities United. All rights reserved.